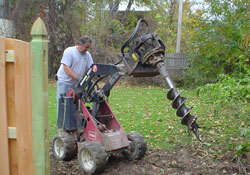 City Fence, Inc. is a second generation family business dedicated to maintaining its status as one of the leaders in the industry. Our employees are considered the best in the business and are offered excellent compensation, a great work environment and the newest equipment and technology to complete the task at hand, and to serve our customers. We are currently recruiting full-time seasonal employees to expand our fence installation teams based at our Lancaster, NY, facility for work on residential & commercial sites throughout Western New York. We are seeking experienced fence installers and we are also willing to train qualified individuals who are without fence installation experience. Employment at City Fence is "At Will" and subject to a Background Check. We are an Equal Opportunity Employer. To find out more please use the Employment Interest Form, or Call 716.206.0511, or e-mail. To Talk About Employment Opportunities At City Fence, Please Call 716.206.0511 e-mail, or Complete The Employment Interest Form. For Security, please enter the code shown in the image before pressing SUBMIT.